Oaxaca is not only the Mexican state with the most ethnic groups and where the most indigenous languages are spoken; it is also the state where there are the most species of plants and animals. Many of these plants have provided aesthetic and intellectual stimulation to the people of Oaxaca for over twelve thousand years, and served as food, fuel, fiber, medicines, flavorings and colorings. The Jardin Etnobotanico celebrates the state of Oaxaca’s exceptional botanical diversity. Blessed with a geologic complexity that includes deserts and cloud forests, beaches and temperate woodlands, Oaxaca is one of the richest ecosystems in the world, boasting, for example, more species of cycads, and agaves and varieties of chili peppers and maize than anywhere else on earth. The Garden is part of the Santo Domingo Cultural Center, which occupies the former convent built in the 16th and 17th century by the Dominican friars. The site of the Garden was part of the old convent garden. This space served as a military garrison from the mid-nineteenth century until 1994. In colonial times it had uses related to convent life, as seen in the remains restored the interior of the Garden: Irrigation and drainage canals, ponds, lime kilns, laundry facilities, a kiln and a paved road for the wagons that supplied food and fuel. Making used of the convent’s 16th century courtyard, the artist Francesco Toledo, fellow painter Luis Zarate and ethno biologist Alexandro de Avila, sought to build not just a decorative garden but one that would tell the story of the relationship between the people and the plants of Oaxaca. Emphasis has been placed on indigenous plants, both past and present, for medical, household, food and religious purposes. Started in 1998 the Jardin Etnobotánico has been planted in plant varieties originating from different climatic regions of the state of Oaxaca. It covers almost 6 acres with over 7,000 collected specimens of 965 different species (11% of the flora of the state). The garden is organized in different climatic zones, most importantly into wet and dry zones. You may visit via guided tours in Spanish or English. English language tours are at 11 AM on Tuesday, Thursday, and Saturday, last for two hours, and provide an excellent overview of both the flora of Oaxaca and its traditional uses. The cost of 100 pesos will be the best spent in you visit to Oaxaca. The following provides a short list of some of the main features of the garden. • A sculpture, created by Toledo out of a massive piece of Montezuma cypress clad in mica greets visitors at the courtyard’s entry. Red-dyed water drips over the cypress block, representing the importance of the cochineal. 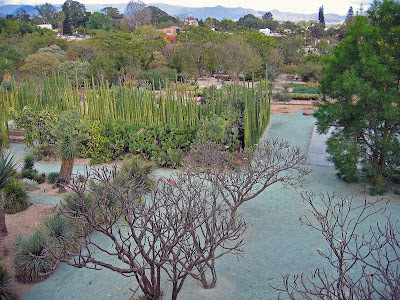 • Francisco Toledo and Luis Zárate, artists from Oaxaca, helped in the design of the garden. 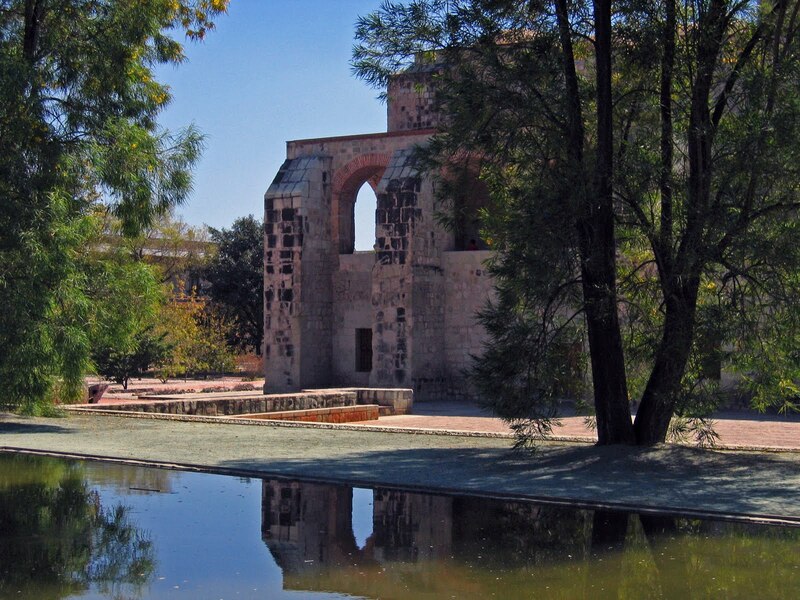 The "Court of Huaje" and source "La Sangre de Mitla" are the work of Maestro Toledo. The source "Cuanana Mirror" and the sculptures that change the level and direction of water along the canals are the work of Zárate. The Garden also has wood and stone works of artists Jorge Dubon, Jose Villalobos and Jorge Yazpik. • Newer archaeological remains, those found in the courtyard – irrigation canals, pools, the lime kilns where mortar was prepared during the construction of Santo Domingo, laundry basins used by the novices, a pottery kiln – contribute to the garden’s cultural importance and understanding of the everyday life of Dominicans in the seventeenth century. • A garden of cycads, plants that evolved over 230 million years ago during the Jurassic age of dinosaurs, was donated by Conzatti Casiano. Oaxaca has more than 20 species of cycads, most of them endemic. • A section of the garden is devoted to species found at Guilá Naquitz, a small cave located near Mitla in the Valley of Oaxaca. It was known to have been occupied by hunters and gatherers between 8000 and 6500 BC. Archaeologists found the remains of plants used for thousands of years, including acorn, pinyon, cactus fruits, and evidence of cultivated bottle gourds and squash and beans, and the oldest remains of corn reported to date - at 10,000 years old, these are the earliest remains of agriculture known so far in the Americas. • The garden has a library open to the public specializing in natural sciences and environmental conservation ethno biology, open from 9:00 to 19:00 hours Monday to Friday and from 9:00 to 13:00 on Saturdays. 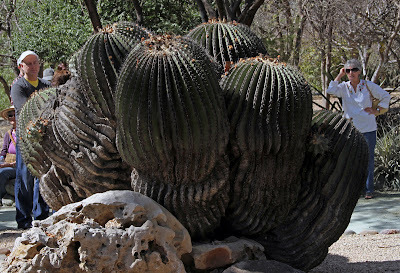 • Perhaps the plant that attracts the most attention of visitors to the garden is a large barrel cactus weighing over 5 tons and several centuries old. 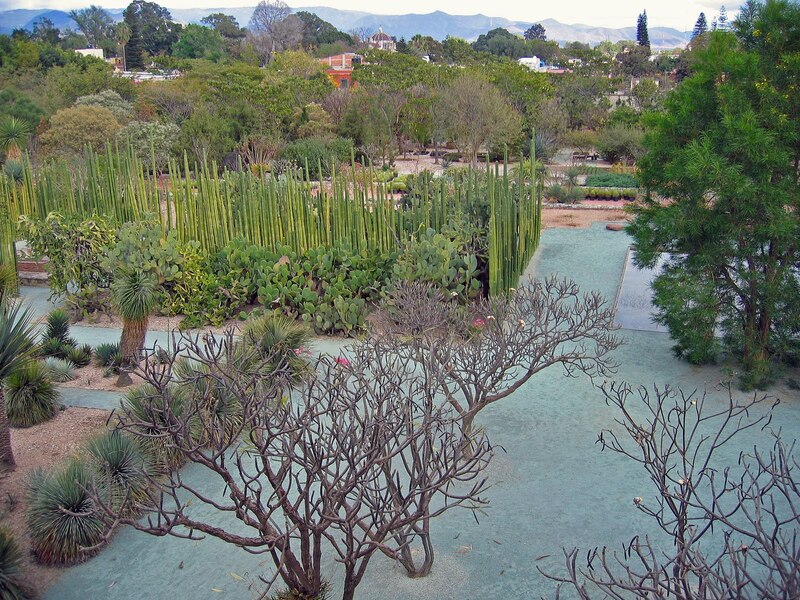 • The garden has the largest rainwater collection system in the State of Oaxaca, with a capacity of 1,300,000 liters. Rainwater stored in the tank feeds the irrigation system, canals and ornamental ponds, and the cultural center. 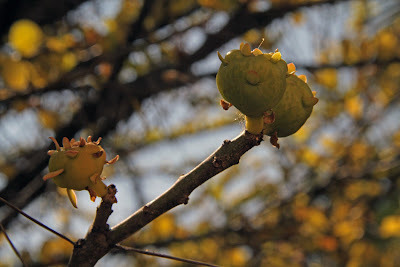 To view more pictures visit Jardin Etnobotánico. Reforma s / n corner Constitution, AP 367. Centro, Oaxaca, Oax.